Fun to build and great to drive. The KV4 is a fabulous velomobile kit that is fun to build and great to drive. The all aluminium KV4 is based on decades of development of the Alleweder. 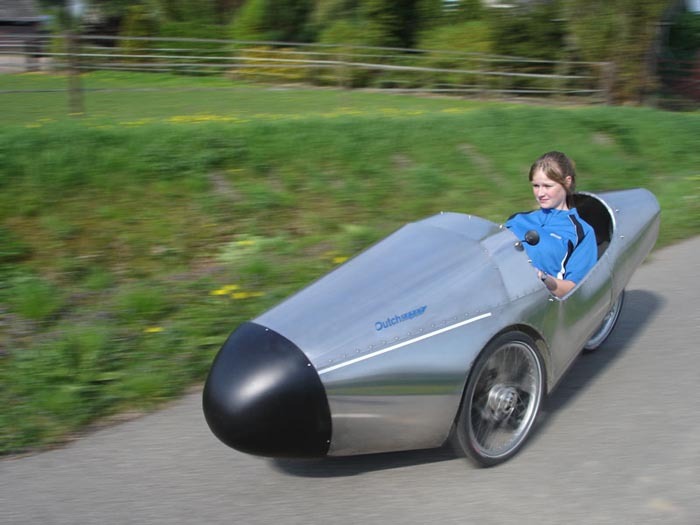 The famous Alleweder velomobile goes back to the late 80's. The KV4 is a complete redesign following the proven technology of the Alleweder. So it is a well developed product that has proven very suitable for everyday use. A prototype had already made over 10,000 km without problems before the first production run was started. 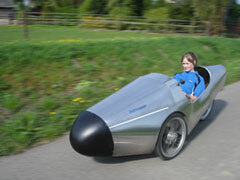 A velomobile is a streamlined recumbent bicycle. Because it is a lot faster and more comfortable than a standard bike it is a practical zero CO2 emission mode of transportation. The production of the aluminium that is required to manufacture a KV4 kit produces an estimated 59 kg of CO2. That is the equivalent of no more than a 313 km drive in an average European car producing 189.8 gram CO2 /km! Lot's of attention for the KV4 during a tour through the Netherlands. 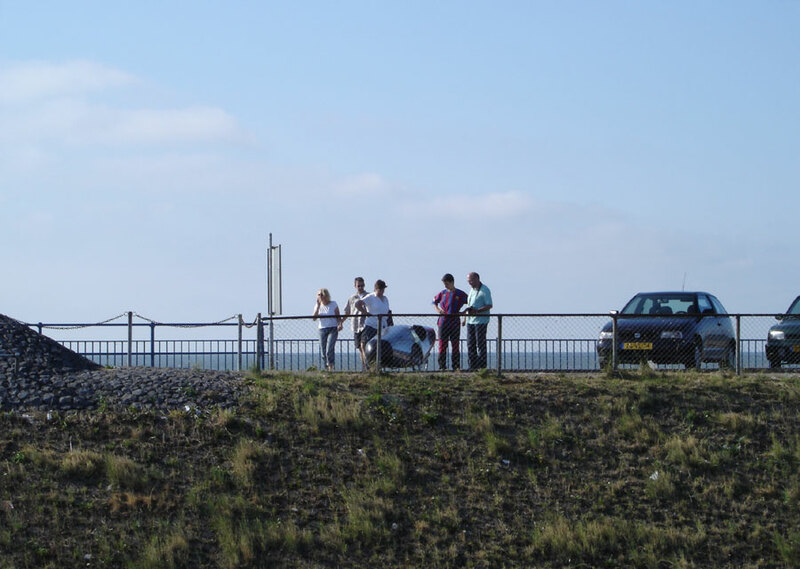 Here on the middle of the Dutch "Afsluitdijk" in the north. The KV4 is the worlds most affordable velomobile. The KV4 is completely streamlined. It is the streamlining that makes it very, very fast. Yet in designing the streamline, no compromise has been made to every day use. There may be even faster velomobiles, but the KV4 is exceptionally pleasant and practical to drive!  A step by step assembly manual with lots of pictures is available for free on this site. The kit comes in two boxes and a flat pack delivered to your doorstep. It is complete down to the last rivet, wheel and cable, no other parts are necessary. The KV4 is produced by Alligt, a Dutch recumbent specialist company that has a long experience in Aluminium Recumbents and Velomobile building. Based on the classic Alleweder, Alligt has taken the development to the next level, most noticeable introducing large CNC milled parts. Giving it great looks and making it much easier to build. Dutch Speed Bicycles is using its experience in selling recumbent kits over the internet to give this velomobile the audience it deserves.